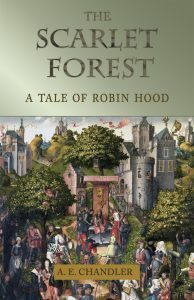 Historical-FIction.com welcomes author A. E. Chandler with an article on her novel based on the story of Robin Hood, The Scarlet Forest. Fans of the legend shouldn’t miss this retelling! Read on for more details. Chandler: At four years old, I first saw the Disney cartoon movie of Robin Hood, and since then he has been one of my heroes. 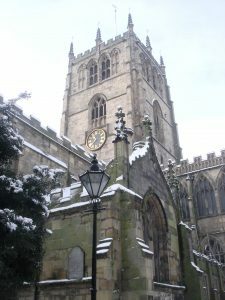 As a Medieval Studies grad student at the University of Nottingham, I took history and archaeology, as well as Middle English language and literature courses, with the goal of writing a well-rounded dissertation on the social history behind an early to mid-thirteenth century Robin Hood figure. Studying at Nottingham was an amazing opportunity to pick the brains of a number of expert medievalists, gain access to a dizzying amount of source material, and experience the places where Robin Hood is said to have trod. Living in Robin Hood Country showed me a lot. I joined the university’s archery society, practicing three to six hours a week, and shooting within the grounds of Nottingham Castle, as well as in Sherwood Forest, “poaching” a plastic deer. I also spent three days at a workshop in the woods on the Derbyshire-Leicestershire border learning how to hand carve a bow. On Sunday mornings, my usual haunt was St. Mary’s parish church in Nottingham, where Robin Hood is said to have been captured by the Sheriff. This arrest is at the core of one of the more obscure medieval tales, which I later included in my novel The Scarlet Forest: A Tale of Robin Hood. In the fragmented original poem, Little John comes across as the main character. When retelling the story, I took the opportunity to bring to the foreground a number of characters, and show them working together in Robin’s absence to effect his rescue. At Sudeley Castle in Gloucestershire, I saw the field where Robin, Anne/Marian, and Will Stutely played as children – where Anne finds Robin after he falls out of favour with Pypa, his first love. It’s strangely satisfying and disconcerting as a writer to realize that you’ve accurately described a place (or a person) that, up until that moment, you thought only existed in your imagination. The rough draft of The Scarlet Forest: A Tale of Robin Hood spans six coiled notebooks that have my literal blood, sweat, and tears in them – as well as a teenage boy’s sneezed up Pepsi. The rough draft took exactly one year and one week to complete. However, the crafting of a manuscript is very far from over when the rough draft’s last line is written. I ended up completely rewriting the first forty pages of the manuscript. Probably the only part to survive is when Robin sees Anne for the first time in six months and doesn’t “know whether to flush red or drain white.” The Scarlet Forest is well acquainted with rewrites. Some sections have been cut entirely, new sections added in elsewhere. Individual scenes have been combed through over and over and over, shaving every last unnecessary word – until the next time found more. After all the editing, it’s still the moment of finishing the rough draft that sticks in my mind, of walking outside, and for the very last line resting the notebook against a tree branch. It seemed fitting. After all, according to Noyes’s “Sherwood,” the greenwood is where Robin Hood can still be found, if you listen. You are invited underneath the great greenwood tree to hear how a young man became a hero, and a hero became a legend. When Robin takes a shortcut through Sherwood Forest, the path he chooses leads not to Nottingham’s archery contest, but to a life on the run from the law. Unable now to become a knight, and joined by his childhood friends, Robin Hood leads the most infamous outlaw band ever to evade the king and his sheriff. 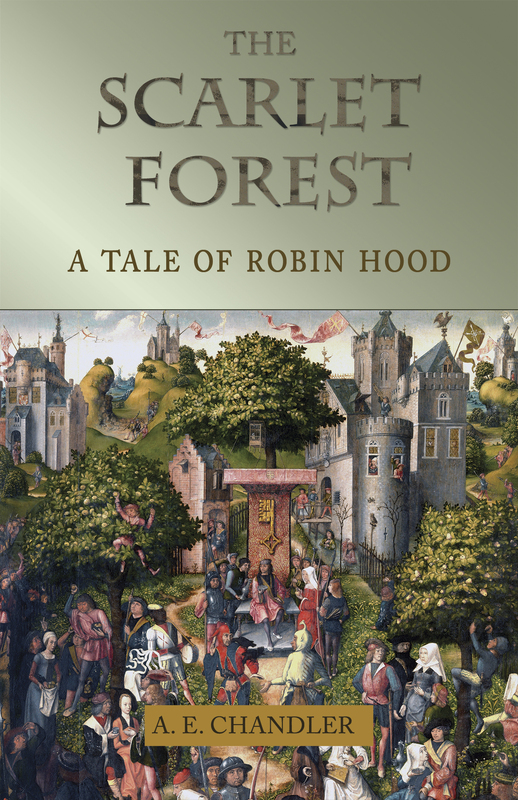 Blending true history with new stories, popular inaccuracies, and some almost forgotten medieval legends, The Scarlet Forest: A Tale of Robin Hood brings a new life to the greenwood, which here feels as fresh as it does traditional. With an academic background in medieval English studies, A. E. Chandler captivates with this nuanced and unique reinterpretation of Robin Hood’s struggles and adventures. The forest is waiting.